This Pink Moscato features delicious peach notes layered with tropical fruit and hints of floral. The natural sweet aromatics make this wine a great complement to Asian cuisine, light desserts, fresh fruit and mild cheeses. 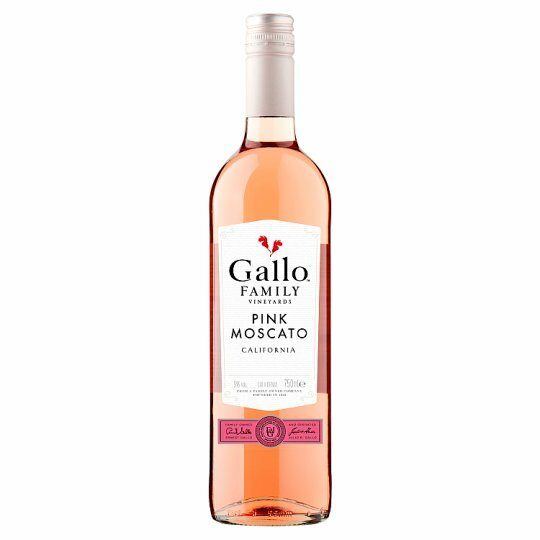 The grapes for Gallo Family Vineyards Pink Moscato were harvested at optimum ripeness during cool night temperatures to preserve the fresh fruit flavours. The winemaker selected particularly aromatic yeast strains and employed a moderate fermentation process, which together have enhanced the natural flavours and expressive mouthfeel of this wine. Proper storage after fermentation has preserved the natural bright flavours and balance in the wine. In 1933, brothers Ernest and Julio Gallo founded a winery in California with nothing but a love of wine and a lot of determination. Four generations later, we continue to craft great-tasting wines for every occasion. The grapes for Gallo Family Vineyards Pink Moscato were harvested from select vineyards in California's Central Valley. This location, at the mouth of the Sacramento Delta, provides a unique geographical advantage for growing grapes. The climate here offers beautifully warm days and cool, breezy nights - ideal conditions for perfectly ripe fruit.